Have you got students soon to be graduating? Here at Aford Awards, we offer a selection of graduation trophies, ideal for when university students, sixth formers, college students or school leavers finish their period of education at that institution. A graduation trophy or award is perfect as a show of recognition for that student's hard work throughout the year and academic achievements. We have over 30 years of experience supplying graduation awards across the UK. Over this time, we have built a strong reputation as one of the most valuable and leading trophy suppliers and engravers in the UK, as supported by our excellent rating on TrustPilot. We are proud of the reputation we have developed as a result of our excellent customer service, unrivalled attention to detail, and the utmost care in everything we do. In addition to this, you can also guarantee to find trophies as the best possible prices, whilst not compromising on quality. Browse our range of graduation trophies and without a doubt, you’ll find exactly what you’re looking for. Although graduation is typically associated with finishing university, graduations can be a suitable means of celebrating any student leaving at any one time, whether that be finishing school, sixth form or college for example. 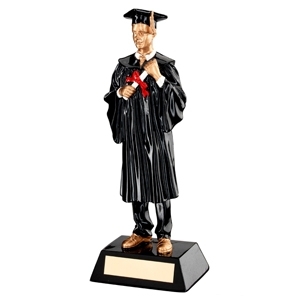 As such, we have a range of graduation trophies suitable for every occasion. A trophy is appropriate for recognising one’s ability to finish school, 100% attendance, highest grade and so forth, Our Black & Gold Male Graduate Trophy is suitable for males graduating, while Black & Gold Female Graduate Trophy and Bobblehead Female Graduation Trophy is suitable for females graduating. Without a doubt, a graduation trophy from Aford Awards will make your ceremony a truly special occasions for students and family and friends alike. What’s more, we also offer a variety of more general trophies, cups, medals and plaques that could be of interest. We understand that finding the right trophy can be a difficult time and it is important to get these things right especially in the event of a graduation. That’s why we also offer a bespoke trophy service. This means you can work closely with our in-house design team to craft a unique trophy designed to your specifications. One of the reasons our trophies cannot be rivalled is due to the quality and price of our products. We ensure each of our trophies are manufactured using premium quality material whilst keeping the costs as low as possible. Undoubtedly, a quality looking trophy is one you’ll want to show off and sit pride of place in your home. What’s even better, each of our standard graduation trophies can be tailored to you; for example, you may want to add personalised text which includes the student’s name or the educational institution's name, a badge or logo, which is completely possible when purchasing through Aford Awards. Our customer can also enjoy and benefit from free standard engraving. Using our in-house cutting-edge facilities, you’re able to add a touch of personalisation to any trophy, cup or medal purchased through Aford Awards! What’s more, we also offer a premium engraving service which enables you to engrave personal belongings such as jewellery, tableware, electronics and much, much more - if it’s worth engraving, we can engrave it! If you’re interested in any of our products or services but would like more information, please do not hesitate to get in touch with one of our team members - we’ll be happy to help! You can reach us on 01622 738711 or contact us using our enquiry form. Alternatively, if you’re unable to find what you’re looking for, please explore our crystal glass awards, winner trophies, wooden plaques and achievement trophies.